The 11th annual Stuff the Bus school supplies drive is happening Tuesday. 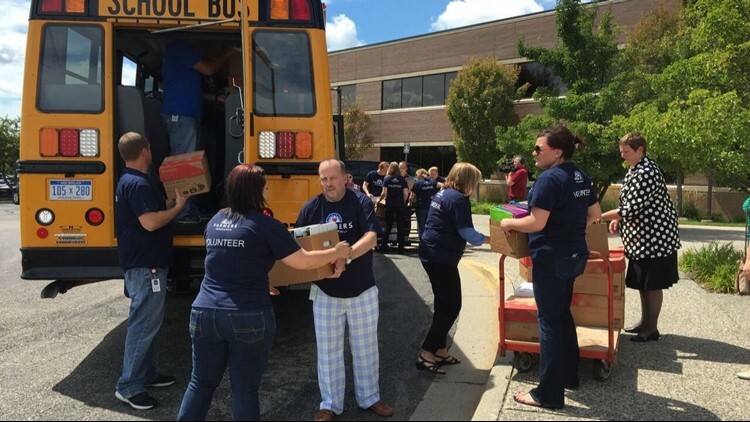 GRAND RAPIDS, Mich. - On Tuesday, August 7, Heart of West Michigan United Way will be "stuffing the bus" with donated back-to-school supplies to ensure that local students start their new school year ready to learn. Now in its 11th year, Stuff the Bus is a partnership between United Way and local businesses to gather backpacks, notebooks, pencils, glue sticks, scissors and other back-to-school necessities for students. Supplies will be donated to elementary and middle school students in Grand Rapids, Kentwood, Wyoming, Kenowa Hills, Cedar Springs, and Sparta school districts. Last year United Way collected more than 50,000 items and expect to collect 60,000 items this year. A traditional yellow school bus will start making the rounds at 9 a.m. on August 7, stopping at 30 locations throughout Kent County to collect donations. The bus will arrive at Farmers/Foremost Insurance later in the afternoon to load supplies. All the items will be sorted and counted by Kellogg's Farmers & ARGI employees and volunteers from United Way's Young Leaders Society and picked up by school districts on Wednesday, August 8.